DESPITE DEMONSTRATIONS and riots, the Greek parliament on January 25th voted to ratify a deal with Macedonia that ends a 27-year-old dispute over its name. 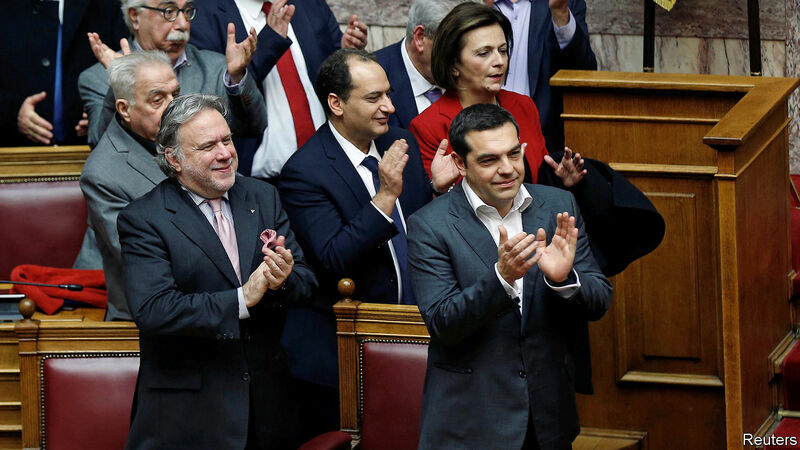 “We are one step before a historic event,” said Alexis Tsipras, the embattled Greek prime minister, who has been accused of treachery by the opposition. “Nationalism in the Balkans has led to disasters…I believe the time has come to escape nationalism.” His plea succeeded. The change was approved by 153 of the 300 members of parliament, two more than needed. The vote means that only technicalities remain before Macedonia formally changes its name to North Macedonia. One step is the formal ratification of a protocol by Greece by which it assents to its northern neighbour joining NATO, though this is not expected to cause any problems. The deal that brought all this about, which was signed in June by the Greek and Macedonian prime ministers, has already seen Greece lift its objection to Macedonia opening negotiations on EU accession. The agreement is a compromise. Macedonia has to change its name to suit Greece but its people will still be known as Macedonians and their language Macedonian, without the addition of the word “North”. When Yugoslavia disintegrated in the 1990s Greece objected to Macedonia, which had been a republic within Yugoslavia since the end of the second world war, being recognised internationally as a new country under that name. Greece argued that the name implied territorial designs on its own Macedonian regions. The Macedonian name deal is a rare success in solving long-standing international disputes. In the Balkans the spotlight will now turn to other issues. Greece and Albania have been in a technical state of war ever since 1940 and several questions, including their maritime border, remain to be solved. The biggest single issue pending remains an agreement between Serbia and Kosovo. Over the past year the presidents of both have discussed a deal which involves a highly controversial exchange of territory.